Continuing a tradition of collaboration and research excellence, our 5th Annual Research Symposium was a success! 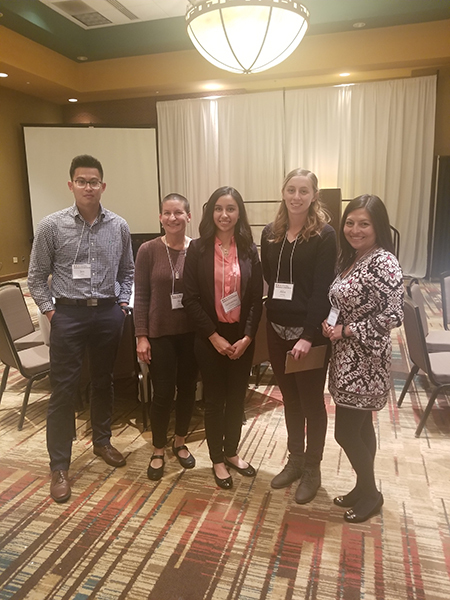 Sponsored by the New Mexico Academy of Science (NMAS), NM EPSCoR, UNM Center for Water and the Environment, and the New Mexico Alliance for Minority Participation (NM AMP), the Symposium took place at the Embassy Suites in Albuquerque on Saturday, November 4th. 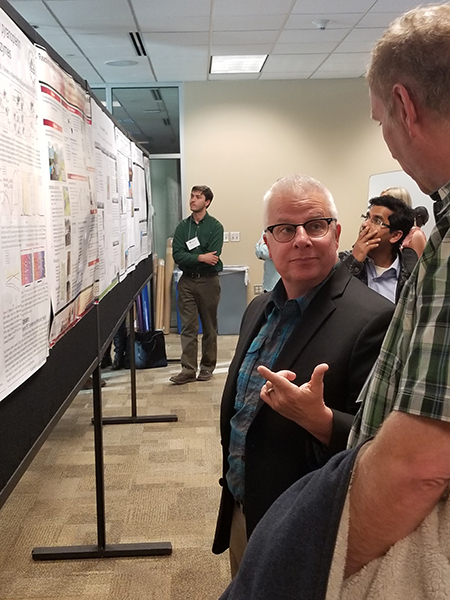 With over 140 attendees, 50 posters, and 30 presentations, the day was filled with networking and topics spanning several STEM fields. 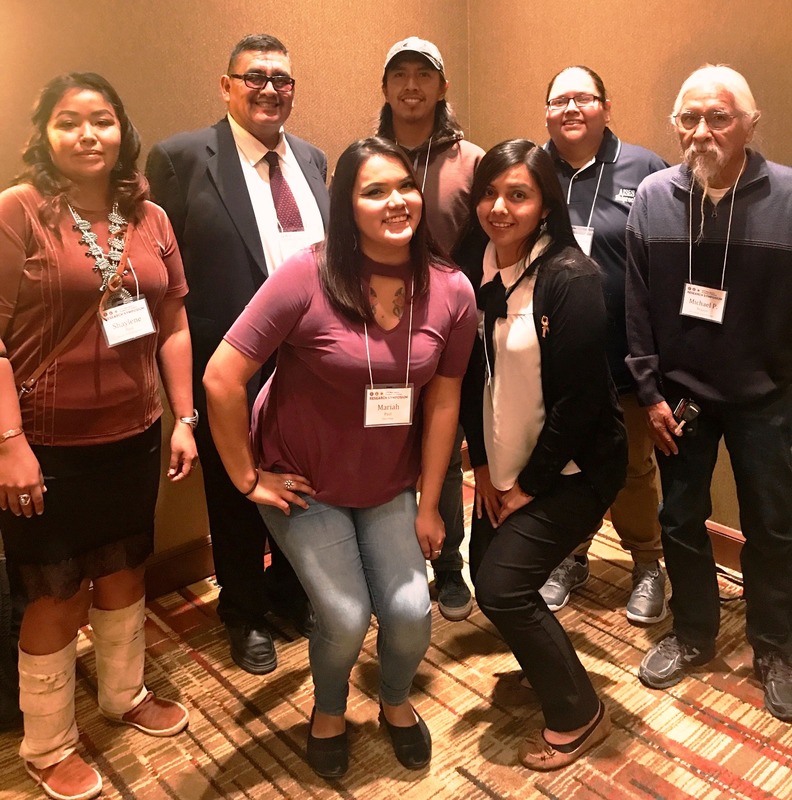 Attendees represented walks of life from all over New Mexico; in fact, over 15 institutions from across the state were represented at the Symposium, including 7 students and professors from Diné College and Navajo Tech (click here to see their picture at the event!). 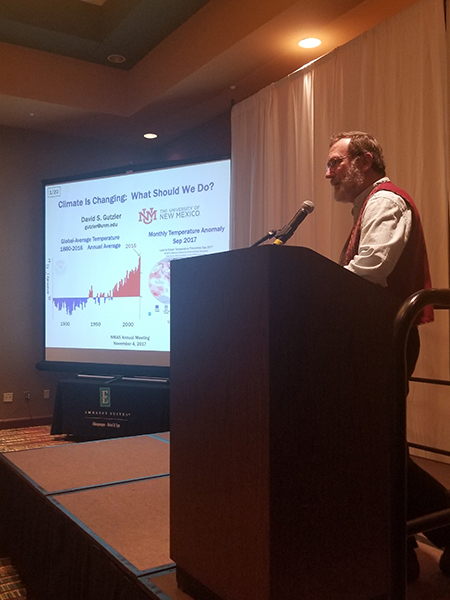 At lunch, we were treated with a fascinating Keynote by Dr. David Gutzler, a climatologist with the University of New Mexico. NMAS and the American Chemical Society also recognized Jessica Sanders of Berrendo Middle School in Roswell as the Outstanding Science Teacher of the Year. Mrs. Sanders is identified as a consistent exemplary teacher within the district, where she esteems students and the entire district staff as an imperative part of the science education structure. Read more about her at the Albuquerque Journal and the Roswell Daily Record. At the end of the day, we had some surprises! A wedding took over our lobby space and treated us with some wonderful Mariachi music! 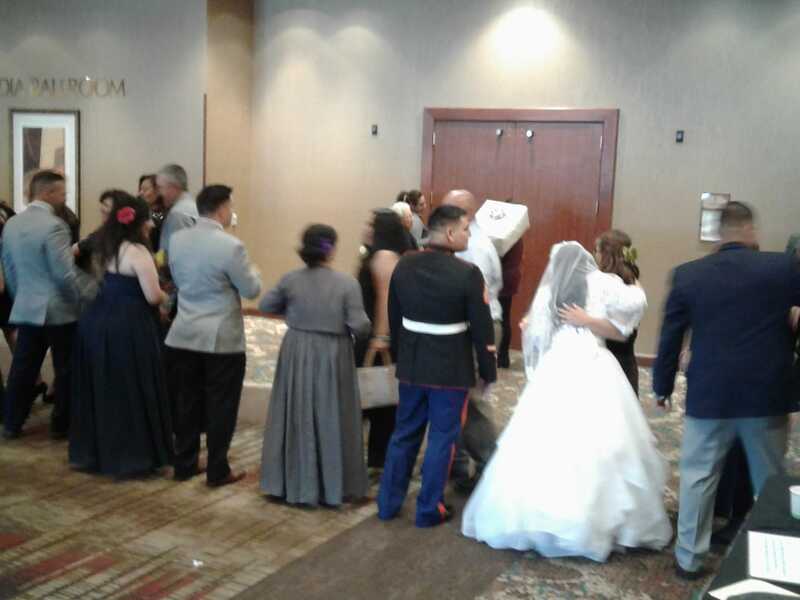 One of the meeting organizers, Selena Connealy, snapped a photo of the wedding's reception line. Luckily, the wedding party cleared out in time to announce the undergraduate and graduate winners of the poster session: Holly Olivarez (UNM, 1st place undergraduate category), Samantha Ceballes (NMSU, 2nd place undergraduate category), Allie Arning (NMT, 3rd place undergraduate category), Carmen Velasco (UNM, 1st place graduate category), Jon Golla (UNM, 2nd place graduate category), and Christina Ferguson (UNM, 3rd place graduate category). All poster and oral presentation abstracts can be viewed online on our Symposium website: https://www.nmepscor.org/nmas/2017/. 2017 Poster Session winners (from L to R in the picture): Jon Golla, Holly Olivarez, Samantha Ceballes, Allie Arning, and Carmen Velasco. Not pictured: Christina Ferguson. 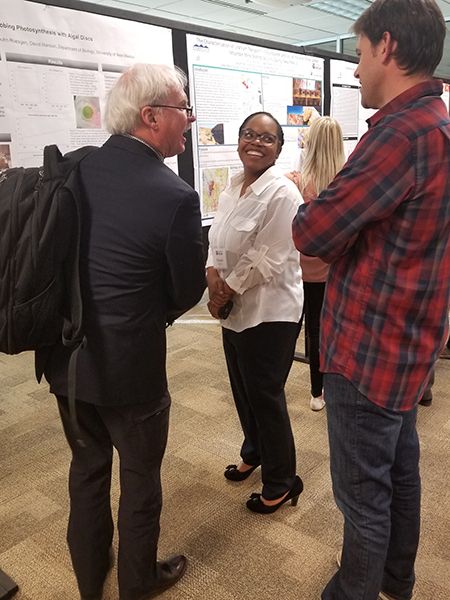 On Tuesday, November 28, we welcomed our researchers and students to our 5th and final All Hands Meeting for the Research Infrastructure Improvement (RII) project, Energize New Mexico. The meeting took place at the CNM Workforce Development Training Center in Albuquerque, and the day was filled with collaboration and goal setting in order to make sure the project finishes strong in the upcoming months. During "Minute Madness" our research components took turns presenting their projects on one slide in one minute—a fun (and challenging!) way to talk about all the progress over the last four and a half years. Breakout sessions helped components make their plan for the year ahead, and a poster session was held at the end of the day. While it was nice to see everyone, the event was bittersweet as we will have to say goodbye to many of our participants when Energize New Mexico comes to a close next year. Thank you to everyone who attended!